"A girl needs three things in life: A comfy pair of shoes for when she's on the run, a good mattress for when she's laying down, and a good facial moistruster for when she wants to look fabulous doing both." So I thought i'd share my favourite moisturiser EVER. 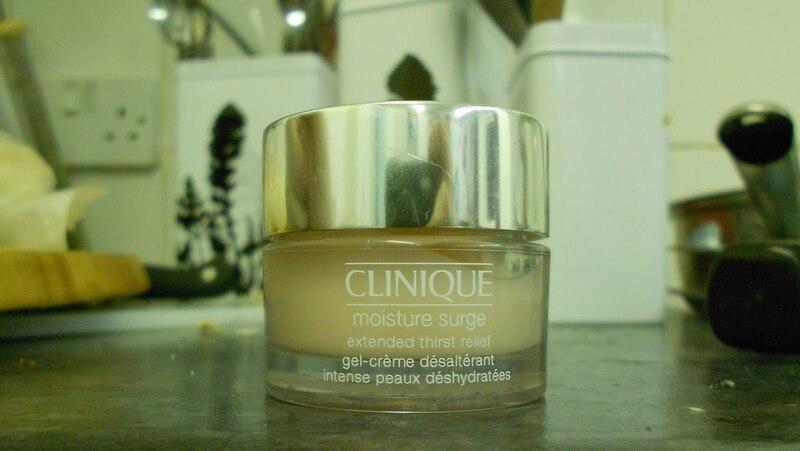 It's Moisture Surge by Clinique, and it is incredible. I first discovered it when I bought Glamour magazine (Or it could have been Cosmopolitan, to be honest I can't remember which one!) and they were giving away free tester tubes. The mistake I made was squeezing out quite a liberal amount and dabbing it around my face. Immediately I felt how light it was, and I ended up having to take some off and rubbing it into my neck and on my elbows so it wasn't wasted. When I finished the tester and bought the 15ml pot, I began tipping it upside down for a second and then just using the bottom of the lid as the amount I put on my skin. Clinique describe this product as 'Extended thirst relief', and it's crazy how accurate that is. As I was putting it on, it was as if my skin had soaked up masses of water and I instantly felt refreshed and cooled down. It isn't oily, and is perfect for after you've just endured a facial scrub or have just got out of a hot shower and your skin is tighter. It can also be used for other parts of the body aswell, like your cuticles to keep them soft and moisturised during colder months. It retails at £30, which I know is steep. But you only need less than a pea-sized amount to cover your face, so it really is good value for money. I have this too and i absolutely love it!